Rahul Kumar (RK): Tell us about the Punjab Kesari group? Amit Chopra (AC): The group started in Jalandhar in 1948 with the publication of the Urdu daily Hind Samachar, followed by Punjab Kesari, a Hindi daily, in 1965 and Jag Bani, a Punjabi daily, in 1978. We started the second edition of Punjab Kesari in Delhi on January 1, 1983. We have grown organically in Punjab, Haryana, Himachal Pradesh, Chandigarh and Jammu & Kashmir. The Ambala unit was started in 1990 and Jaipur in 1997. Following this, there were certain family issues leading to disputes and consequent partition within the two owner families. Once this was sorted out in 2005, we grew rapidly. Now, we have plants in Jalandhar, Ludhiana, Chandigarh, Bathinda, Panipat, Hisar, Rohtak, Jammu, Palampur, Shimla and also in Noida. The units in Rohtak and Shimla are ready to go online, hopefully this year. Talking about achievements, we were the first newspaper to introduce web offset in India, in 1971. We were the first to get photocomposing in Hindi, and first newspaper to start Urdu composing, with the help of Monotype machines, in 1987. We were the first newspapers to have in-house colour scanners, first in North India to do facsimile transmission in colour, and first in North India to start a telephoto system. When former prime minister Rajiv Gandhi passed away, we were the only newspaper in North India to carry a picture of the tragedy. The pictures were transferred from The Hindu office through the telephoto system, a system not installed anywhere else. We were the first Hindi-language newspaper to go all-colour, in all the eight centres in 2008. We are also one of the first newspapers to opt for CTP. First, we opted for thermal in 2005 and later, we went for violet CTPs. We print 1.2 million copies on weekdays and 1.3 million copies on Sundays. RK: Do these numbers correspond to the entire group? AC: Yes, only our group, Punjab Kesari, Jalandhar Group and not the other group (Punjab Kesari, Delhi), which has split from us. In Delhi, we bring out Navodaya Times while from all the other centres mentioned, we bring out Punjab Kesari besides Jag Bani and Hind Samachar. RK: What are the ownership arrangements after the partition in the group? AC: We are completely separate entities. There is no connection between the two groups whatsoever. We have a separate board of directors and there is no concern or interference in each other’s business. There was a prolonged litigation starting in 1999 and under the court monitored settlement in 2005, we got separated. Jalandhar and Ambala came to our share, and Delhi and Jaipur to theirs. As of now, legally, we have no concern with each other. RK: How do you manage, with both the companies using the same brand name of Punjab Kesari? AC: We have different territories. They cannot do business in our territories and we cannot interfere in their. We now have grown to nine centres as listed earlier whereas Delhi and Jaipur are their editions. We are referred to as Punjab Kesari, Jalandhar and they are Punjab Kesari, Delhi. We have our own style of covering news and readers can easily recognise and identify with it so it was not very difficult for the reader’s to realise and understand that Navodaya Times belongs to our group. RK: How easy or difficult was it to educate the public about this when you started Navodaya Times in Delhi? AC: We were not targeting a very large circulation initially. We started with 30,000 copies, which have grown in one year to 85,000 copies. It’s a steady growth. We hope to achieve 100,000 copies by December 2014. We will reach out to our readers steadily. We prefer this growth model. This is how we have grown in other centres. When the group was together and we started Punjab Kesari in Delhi, we started with 3,000 copies. By the end of the year, we had a circulation of 36,000. Our graph now also is steadily upwards, with a strong continuous growth. Delhi is a very large market with 12 lakh copies of Hindi-language newspapers selling every day. There is enough space to grow for all. The viability of a Hindi newspaper is close to one lakh copies, which we are close to achieving. The peak circulation here is about three lakh copies. There are four newspapers in Delhi, each of which is selling around three lakh copies and all are profitable. So, the critical size is three lakh copies. This is achievable. RK: What is your responsibility concerning Punjab Kesari, Jag Bani and Hind Samachar? AC: Being the joint managing director and one of the owners of the group, I look into all aspects of the business. AC: Our father, who is very active at age of 83 and still works hard, is our guiding light. We have professional staff to oversee operations and editorial. My brother, Avinash Chopra, who is a year older than me, and I are the topmost management. Now, our children have also joined the group, and they are involved in managing various areas of the business. RK: What is your background? AC: I am a commerce graduate. But, I was immersed in technology since childhood. Our main plant in Jalandhar was next to our house. When we were in school, we would walk to the printing press and observe the work. This is how we acquired our sense for technology. We used to meet press manufactures, read their brochures, visit their factories... Printing runs in our blood. We understand technology completely, by reading, by observing, learning from experts and people’s experience, attending seminars, and with hands-on experience. While in school, my brother started doing lead hand-composing. He would go to the press and assemble the type. When we started using Technova plates, we would even wash the plates. My brother and I manage the business because we know it inside out, everything – journalism, technology and management. All of these, we learnt every day from the beginning. We are a joint family. The original joint family, my grandfather, my father and my uncle used to have lunch together. So the entire family would gather and we would listen to the elders discuss various things. AC: My grandfather, the Late Lala Jagat Narain, my father and uncle were the co-founders. They were together from Day One. My father was the prime mover. All the growth happened because of my father’s hard work. He looked at management, editorial and technology aspect of the business. My uncle was involved in editorial primarily. My father started the Delhi, Ambala and Jaipur units. My brother and I are actively involved in the business since mid-80s. RK: What, according to you, is the size of the newspaper industry in India? AC: I think India has the largest number of registered newspapers in the world. I would not know overall macro data, but we are a Rs 550-crore group, with 1.2 million copies in daily circulation. This, of course, does not include the separated Punjab Kesari, Delhi group and is only our part of the business. RK: How many titles do you have? AC: We have four titles, Punjab Kesari, Jag Bani, Hind Samachar and Navodaya Times. We also have about 50 local titles, both newspapers and magazines. For example, we have a magazine called Bal Kesari. We have district pullouts like Jalandhar Kesari. It is a title we own. All the local pullouts are independent titles which we own. We have our presence in three languages, Punjabi, Hindi and Urdu. RK: Any plan to expand to more languages? AC: Definitely. We have a couple of English titles, which we may launch in the regional market in future. We are not looking at the national market for English, as it is a very difficult market, very expensive to venture into. We are looking at a small or medium-size English newspaper to cater to the local and regional markets. National English language newspapers are not really catering to these markets. We have an idea of the mood of the market, and this is what we might do in future. Of course, it will happen after Navodaya Times is well established. Right now, we are very busy with Navodaya Times. RK: Does the size of a newspaper, whether broadsheet or tabloid, really matter? AC: See, we have tabloid pullouts and magazine-sized pullouts. However, I feel the Indian market is primarily a broadsheet market. I think the web-width is going to decrease further. Right now, we have moved to 68 from 68.5 centimetres. Many newspapers have done it. Ultimately, I think, newspapers will go down to 25 inches. I am talking about web-width. Newspapers have come down from 33 inches to 32, 31, and coming down in the scale, we are now exactly at 26.77 inches. This, I think, will go down to 25 inches. Thus, a broadsheet page will be 12-and-a-half inches wide. RK: And, on the technical side? AC: I think waterless processing of plate is a promising technology. We are trying it at various places. I don’t think there is any reason why it shouldn’t work, though there is no big advantage to this apart from the fact that it is environment-friendly. Other technology is FM screening, which is being tried out by various newspapers. We are going to conduct a trial. We tried our first FM in 1995. Now, I think, the time has come for it to be used in regular production. We are also trying out spray dampening. Newspapers are using gluing facility for folders innovatively, for advertising. This is something we will have on all our presses. With one slitter and gluer, you can do so many things these days. AC: Automation depends on the size of a newspaper. For small and middle-sized newspapers, a certain degree of automation is enough. For a larger newspaper, automation is important. Automation in terms of register control, auto-pasting and press control, helps improve quality. It not just saves manpower, but enhances quality and reduces waste. We are automating all our plants. However, automations like robotic plate-mounting may not be viable. The same way, robotic reel-handling is not essential in India, where there are too many changes and such short runs. Finally, automation is a trade-off between what benefits it can deliver and the saving in cost, waste and time. For example, The Times of India invested in a robotic plate-mounting machine in its Navi Mumbai plant, but did not follow it up at other centres. Investment in automation has to justify itself. RK: What are the differences between indigenous and imported printing presses? AC: Today, the difference has thinned down tremendously. We have the same qualities in both the presses, especially in coldset. In heatset, we have seen that Indian manufacturers, probably due to lack of volume, cannot achieve the design and quality of imported presses. However, we are successfully using an Indian heatset press for years now. It was recently modified and upgraded and we are happy with the print quality. In certain specialised presses, of course, imported presses are still technologically better, but for newspapers, the difference is thin. RK: What do you use the heatset press for? AC: We use it essentially for the pullouts. We do some commercial work as well, like booklets. We started the pullouts in 1995 and got very good response for its quality. The special pullouts on Sundays and Thursdays were so popular that it raised our circulation and we could hike cover prices on those days, and we got quick return on investment. RK: Is it easy to increase the cover price? AC: Yes. If you are enhancing something, the market is prepared to pay more. Any market will pay higher for better quality. Readership will fall only if your product is not superior. Traditionally, we have always priced our products higher than our competitors and it has worked for us. In Delhi, now, however, we have offered introductory prices, which is lower than our competitors. This is because it is a new title and a new market. As we are offering a product superior than the existing products, eventually we will be able to increase the prices. RK: Coming back to technology, what about training of the staff? AC: This goes side by side. We have always laid emphasis on training. Whenever we install a new technology, we have the manufacture depute people for training. We have an in-house team, who goes from plant to plant to check on quality. RK: A German manufacture once said that India is a prime market for 4x1 printing presses. Do you think so? AC: At a certain level, yes. But, there have not been many sales. 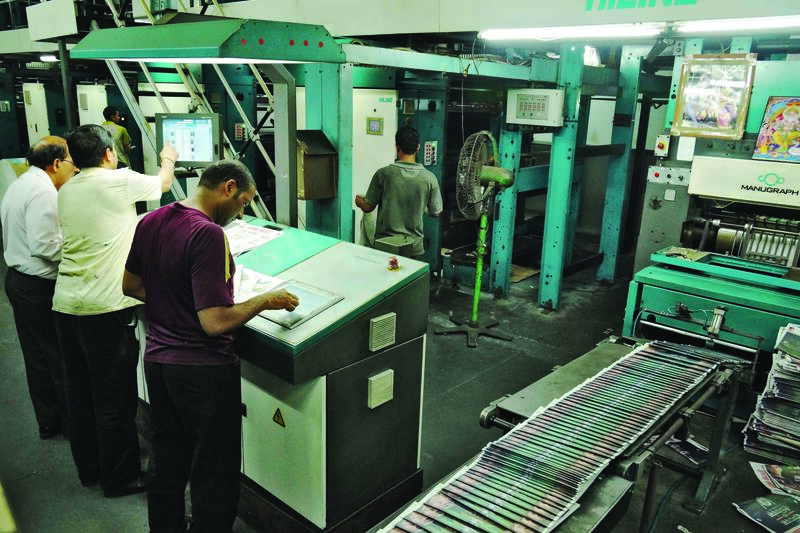 The Times of India bought 4x1 presses. The Bhaskar group bought seven of them. The last one was installed after four years in storage. So obviously, there are hurdles. 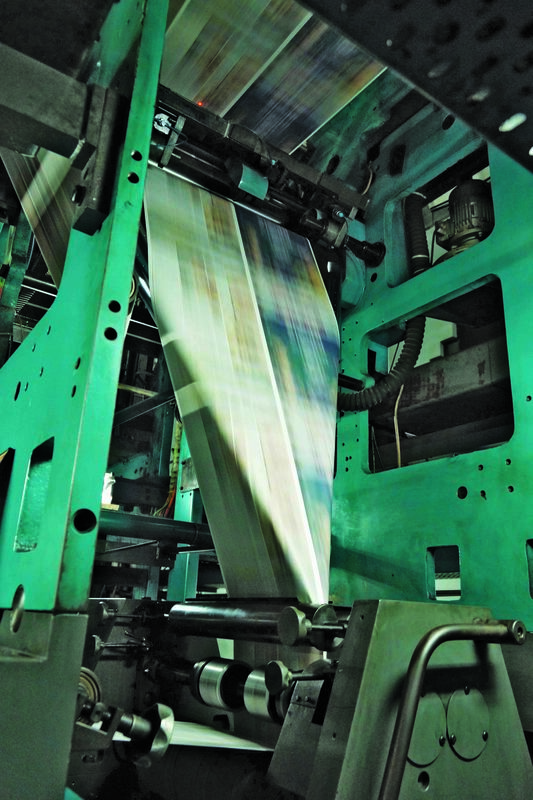 Newspapers like Jagran, Sakal, Loksatta, The Indian Express have no 4x1 presses. Only, The Times of India, The Hindustan Times and The Hindu have them. There is still a long way to go. Cost-wise, it is still not viable to install these machines. RK: What about newspaper revenue? Is it falling? AC: No. it is actually increasing. If you look at the balance sheets of all the newspapers, there is a good growth. It will sustain. I don’t see any hurdles for the next five years. The growth is in all languages, but higher in regional languages. This is because of high literacy and higher awareness. Compared to the growth in population, penetration of newspapers is still very low in India. We have second largest population in the world, but compared to the West, our newspaper penetration is still low. So, there is a lot of scope for growth. RK: Is cover price a factor in growth? AC: Yes. Indian newspapers are still sold below Rs 5. So, scope for growth is still there. Although if one starts giving the newspapers free, they are sold in scrap. So it’s not a viable model, unlike the free newspapers in places like England. At the same time, I believe, cover prices of newspapers are much higher in the US. As long as the price remains under Rs 10, newspapers will continue to grow. No one minds paying Rs 300 a month for a newspaper. For example, at certain places, we sell our issues at Rs 4 on Sundays, and we had no impediment in growth. RK: You have your presence in digital media as well. AC: We are offering epapers free since long. Apart from the online editions, we now have online television, for both our Hindi and Punjabi newspapers. We also have iPhone, Android apps and Nokia apps. For Navodaya Times, we have the epaper. We will launch the mobile app soon. Our readers on these platforms are growing rapidly. RK: Is the presence of the new media a threat to print? AC: I think both the platforms are complementary to each other. See, our business is to provide news. How it is delivered is something that the market will eventually decide. We are valued for our content, so it does not matter how it is delivered. Finally, all the different models of news dispensation will develop and will generate revenue in terms of ads. Right now, print remains our main profit centre. But we have other platforms. We have online TV for both Punjab Kesari and Jagbani. We have good networks to put newsbytes there. We also post interviews and other stuff. RK: Are printing technologies like water-based flexo and digital inkjet viable in India? AC: I think it is too early to comment on inkjet and other technologies. The Daily Mail in England has used it very successfully, and they are producing good quality pages. But, I think, web offset will continue to prevail in India. It’s an easy technology and support is widely available. And it’s cheap. RK: From the point of view of a newspaper production house, what do you expect from ink, paper and printing presses manufacturers? AC: In terms of ink, there are many international players in India, like Flint, Sakata, DIC and Micro Inks. All of them are good. Ink has not given us any trouble for many years now. In terms of plates, I think Technova has done a wonderful job, both in terms of price and quality. In newsprint, on the other hand, a lot needs to be done. Other than two major Indian mills, Khanna Papers and Emami, no one is producing good quality Indian paper. I am not talking about nationalised mills. They are doing good work. However, India needs better paper mills and a plant like Khanna Papers has demonstrated that it can be done. The country needs at least five more mills like Khanna Papers. It will not only help boost the economy, it will also cut import costs. At least 60% of newsprint consumed in India is imported. About printing presses, we are largely at par with international standards. In single width presses, we are the largest in the world and the quality is fairly good. RK: What kind of difficulties do you face while using Indian newsprint? What are the parameters of a good paper? AC: We only use good quality paper and do not have major issues. Breaking length, opacity, consistency, grammage, shade and brightness… All these things matter. You cannot use paper, which is dark. Since you are charging your readers, you cannot give them bad quality print. RK: What do you think of the trend where heatset machines are replaced with coldset machines fitted with LED lamp and hybrid inks? Constrain of space is a major concern. Do you see a trend where a single machine will do the work of two machines, the concept of combination press? AC: We have a combination press in Jalandhar. It is a gas drier heatset machine, which we use for printing pullouts. These kinds of machines are useful for certain things, but I feel, in the long run, hybrid presses deliver neither a good coldset product nor a good heatset product. I feel both should remain separate. Hybrid presses historically have been a bad idea. RK: What kind of role can a technical team of a newspaper publication house play in cover price war? AC: A technical team can help you cut cost by reducing wastage. As margins have grown thinner, everyone needs to step up to save money. So, the technical team has a big role to ensure that the newspaper keeps costs under control. Newsprint is the single biggest cost in publishing, and if you can keep the wastage low, you can cut newsprint cost. RK: What initiatives you have taken to cut wastage? AC: Training, and monitoring of start-up and total wastage. It’s something we constantly focus on. PWI: What is the key to Punjab Kesari’s growth? RK: What is the configuration of average newspaper pages? AC: We have a typical structure of 16+4+4 pages. Minimum, it can be 12+4+4 pages. Often, we go to 32 pages, 20+8+4 pages. The three sections include the main section, a magazine and a local pullout. RK: Any plans of mergers and acquisitions? AC: There is nothing available at the moment! We believe more in organic growth, which is why we went for a new launch and did not try to buy a newspaper in Delhi. To be frank, there was nothing available. If there is an opportunity, we will definitely look at it. RK: Talking about revenue models for newspapers, it is largely based on advertisement revenue. Will this continue? AC: The emphasis is on advertisement. Traditionally, Hindi and regional medium newspapers had 60-70% of its revenues from the cover price, and the rest 30-40% from advertisement. Over the last few years, this trend has reversed. I think this will continue for the foreseeable future. RK: What kind of innovations you are doing for your advertisers? AC: Everything. We do flaps, booklets, pullouts in heatset. We will be doing innovative ads, like gluing and pop-ups, very soon. RK: What about the advertisers? Do they ask for square centimetre space or packages? AC: Small advertisers go for square centimetres. However, larger advertisers want packages. RK: During the last Wan-Ifra conference in Bengaluru, we saw inkjet heads on web offset presses, for personalised ads. Do you see such technology catching on in India? AC: Some newspapers are doing it. However, it is not very viable for Indian newspapers to deliver that kind of ads. I think pop-ups, special folds and inserts are more popular. RK: We have a tendency to compare Indian newspaper industry with that of Europe and the US. Do you think it is a good trend? AC: We are better off in terms of viability. Newspapers in America are on the decline, but we are on a growth trend. So it is wrong to compare in terms of long term viability vis-à-vis American and European newspapers. They have different business models. We will continue to survive. Despite broadband catching on in India, I don’t think newspapers will be impacted negatively. Our newspapers are cheap. We have 20 official languages. There is so much local content that I don’t think the online media can do justice to that. I don’t see major hurdles in growth and survival for the next five to seven years. AC: Display ads are more in use in India, which is a good thing. The proliferation of online sites for job or matrimonial services has affected the classified business, primarily in the English-language newspapers. Our classified are still two pages a day. But, display ads are more important for us and a bigger revenue earner. It is one of the reasons why the viability of Indian newspapers is not threatened. We have a decent share of classified revenue, but it was never a driver. RK: Lastly, what Punjab Kesari has in store for future?